Soft Gel surrounds the sandal ‘thong’ or ‘post’ to reduce friction, prevent blisters and irritation between toes. Extended Gel pad protects ball-of-foot, absorbs shock and adds cushioning to thin-soled shoes. Washable. Reusable. 1 pair. Cut slit in plastic backing and place in sandal to test for fit. Upright section wraps around toe post. Trim if necessary. 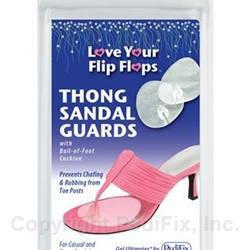 Remove plastic backing and press into sandal. Hand wash in warm soapy water. Blot with towel and air dry completely before reuse. Maintains adhesive properties even after washing. Must be thoroughly dry to re-adhere. If you have diabetes or poor circulation, consult your doctor before using. Keep out of reach of children and pets.